Welcome to the Game Night Blog Carnival for March 2012! You can get more information about the carnival at the main Game Night site. Sometimes after a particularly hard week at work, I don't want to play anything even remotely cooperative. For those weeks, the autoduelling arena calls. Pick your vehicle and shoot your friends, breaching their vehicular armor, putting them out of commission, and hoping to be the only survivor in Car Wars: The Card Game. I happen to own both versions. Second Edition 2001 on the right. Steve Jackson Games put out Car Wars in 1981. The paperback-sized plastic case held hundreds of tiny paper markers for vehicles, pedestrians, smoke clouds, mines, and other hazards. The setting behind the game capitalized on the energy crisis and popular post-apocalyptic fears, set a consistent 50 years in the future. In Car Wars the world crisis steered clear of the Cold War turning hot in favor of oil running out. Manufacturers switched to electric cars and someone started strapping weapons to cars when the government started falling apart. Then the armed car fans got organized into the Autoduelling Association of America, the AADA. Rules of engagement were laid down, and postmodern blood sports became the stuff of high-paying prize purses and fame for the lucky drivers. 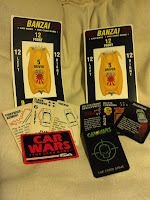 Car Wars was fundamentally a miniatures game with RPG-like rules covering all manner of situations and maneuvers, but the game tended to focus on tournament play in the Autoduel Arena. A crowd enters and whoever has the luck and skill to survive gets rewarded. This simple idea drove the development of something a little lighter in the rules department. 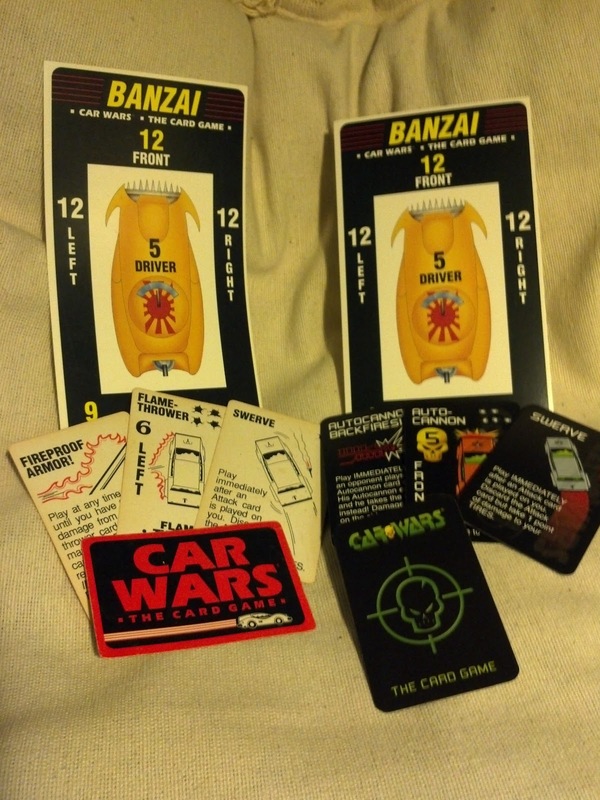 Car Wars: The Card Game came out in 1991, and the second edition followed in 2001 which also included cards to allow combining sets with the Battle Cattle card game. Extending that timeline forward means we're overdue for a third edition or at least a reprint. Right, Steve Jackson? It retailed for $24.95, but it's out of print. You can find copies for around $40 on Amazon and eBay, though I did see a set listed for $8 on Board Game Geek. Attack cards have a weapon type (Machine Gun, Missile, Autocannon, or Flamethrower), attack value (3, 4, 5, or 6, respectively) depicted with convenient bullet holes for easy tracking on your car's armor, and an armor facing so you know what you're shooting at. Some cards have Called Shot instead of an armor facing, so you get to decide which side to attack when you use it. You can also attack tires directly with a Called Shot card. Pro Tip: Since the game is about taking out everyone else in the arena, always attack when you can. Armor cards always stop 3 points of damage. They always include an armor facing, and there's no way to change the facing on an armor card. Special Cards, which covers everything else including Spin and Swerve cards to avoid damage, and attack negation cards by weapon type. More on these later. There's also a rule sheet, but that's it. Being a card game, the cards control everything. I played my first edition into the ground (notice the wear in the picture), and it took me a while to start liking the slick graphics on the second edition cards, but now that's the set I usually use. Each of the cards has text describing its effects. Sometimes it may drone on a bit, but it's handy for people learning the game, and the bold graphics let you readily identify the card once you've learned how it works. The cards are nicely laid out and intuitive to use when stacking them on your vehicle to depict damage or other lasting effects. 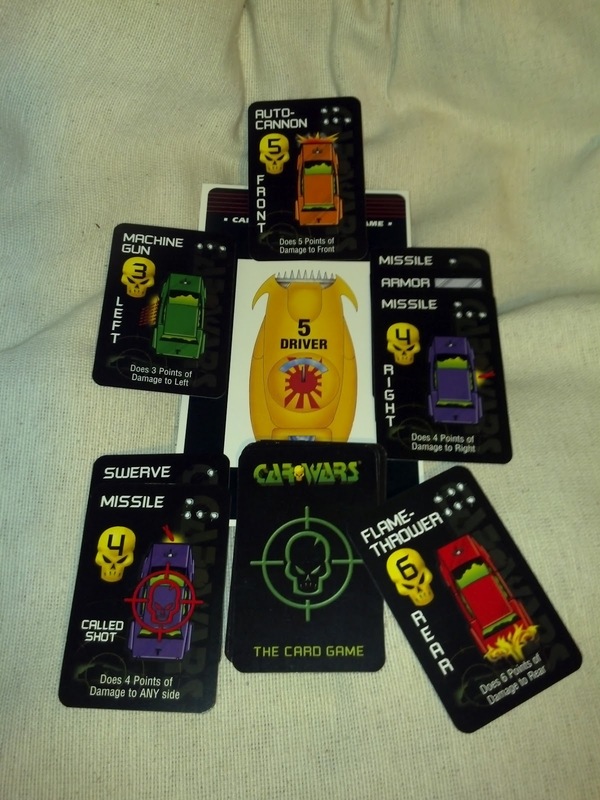 Car Wars: The Card Game needs 2 to 6 players and somewhere around 20-30 minutes to play. It works well for kids who can handle basic strategy and who can understand the text on the special cards, so I wouldn't recommend it for kids younger than 8 to 10 - your children and mileage will vary. More players doesn't usually mean a longer game since everyone attacks a side where you don't have armor and you only replenish cards on your turn. Defensive cards are rarer than attack cards to ensure carnage. On your turn, you draw up to 6 cards in your hand and take one action. You can attack, play a special, or just discard down to 5 cards. If you're sitting on a hand full of special cards and armor, discarding may be your only option. When you attack, you indicate who you're attacking in what armor facing and with what weapon. That player gets a chance to defend using armor or special cards. You track damage by stacking attack cards on the armor facing so everyone can easily see how damaged your vehicle is. I love the armor card design; you play armor so it covers one row of damage on the attack card (see the right side in the photo). You can play multiple armor cards to armor away an attack, but it must be on the turn the attack took place - no retrofitting armor in the arena. Breaching an armor facing means flipping over the cards on that side, like the rear armor facing in the photo. After that, attacks to the rear hit the driver. Once your driver takes 5 points of damage, you're out of the game. I've won games with 4 points of damage to my driver and one point of armor left on my entire vehicle. I can just imagine the trophy ceremony, the battered driver spitting out bloody teeth and wincing when raising the trophy overhead. Good times. The weapon negation cards add a nice twist. Each targets a single weapon type. Dud Missile just negates a missile attack entirely, but the rest of them have other effects. Machine Gun Jams prevents the attacker from playing machine gun attack cards (the most common in the deck) until they skip a turn to discard their hand and clear the jam. Autocannon Backfires forces the attacker to play their autocannon attack card on their own vehicle and only armor can help them against that attack. This is especially embarrassing when it breaches the attackers armor or kills the driver. Flameproof Armor make your vehicle immune to further flamethrower damage if you haven't taken any damage from flamethrowers so far in the game. Your tires are important. Once they're destroyed you can no longer swerve to avoid damage (causing a point of damage to your tires), or spin to apply an attack to a different armor facing where you may actually have armor cards. They can take 9 point of damage before they're destroyed. They can take direct weapons fire with a Called Shot attack or with a Tire Shot card, which ignores the facing of the weapon and applies the damage to the tires instead. I like Car Wars art. There are a few other cards. Skid into wall lets you hurt anyone who just swerved or spun by doing 3 damage to the left or right side of their vehicle, your choice. It makes a great spoiler card when two players beat on each other and you can add a little extra damage to the party when you're not otherwise involved. Ramming is new in Second Edition. You do damage to the specified side, and you can follow up with an attack card to the same side if you have one. It's the only card in the deck that lets you attack twice on your turn. The rest of the game involves shooting, avoiding damage, and revenge attacks for breaching armor. Relentless attacks for perceived slights make the best games, especially when you can pick off the weakened victor of that dogfight and win. The cards dictate what you can do in a turn, but there's some strategy available in larger games. Usually someone declares they're out of armor on a side during an earlier attack before they draw new cards, and everyone with attack cards for that facing pile on the munitions. That makes larger games take about the same amount of time as a 2 or 3 player game. We've implemented a house rule. Since you can clear a Machine Gun Jam by skipping your turn and drawing a new hand, we also allow skipping your turn and drawing a new hand without a Machine Gun Jam. You need to decide to skip your turn before drawing cards for your turn. Since Flameproof Armor as written is useless if your vehicle has already taken damage from a flamethrower, we play that it negates a single flamethrower attack regardless of how your vehicle has been damaged so far in the game. Also, there are rules for escaping the arena. I have never even considered using them. Voluntarily leaving the arena means voluntarily leaving the fun of vehicular combat - you'll need to wheel my corpse out, preferably still strapped into the driver's seat of my Banzai. This game can be frustrating at times when you're looking for an attack left card and all you draw is front armor, but the games cycle quickly and carnage visits everyone eventually. If someone wins a game, everyone tends to attack that person in the next game, so it all works out. I can't think of a better stress reliever than a really fun card game that encourages you to shoot your friends in a regulated and legal manner. Larger games get wild with weapons flying every which way, but it works well with 2 or 3 players as well. If you can find a copy, buy it for fun times with armed vehicles in a short time. If you want to play, I'll have it with me at PAX East this year, Friday and Saturday. Tweet me (@twwombat) at some point so we can snag a table in the tabletop area and do our best to destroy each other. 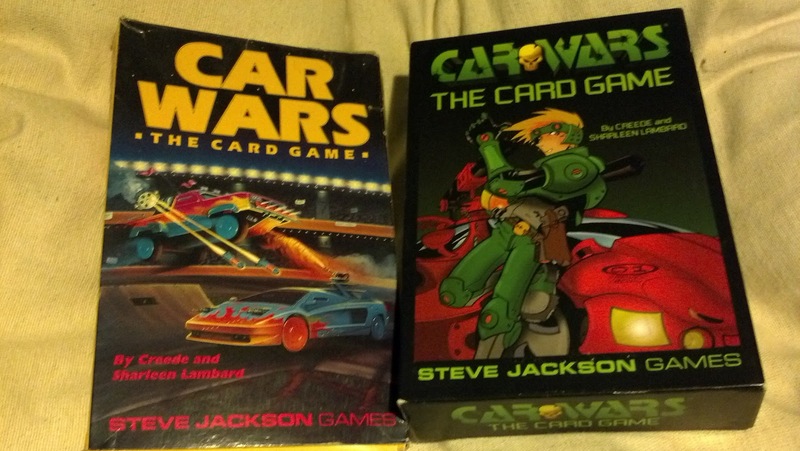 Card Game version of Steve Jackson's Car Wars. Out of print, but please bug Steve Jackson for a 3rd edition. For 2-6 players, and older-kid-friendly. Scales well at all sizes. Games run 20-30 mins. Shoot at everyone else and try to survive. Random, but well-balanced deck rarely causes frustration. Special cards need some reading, but attack/armor are intuitive. Excellent fun. Find me at PAX East and I'll show you.